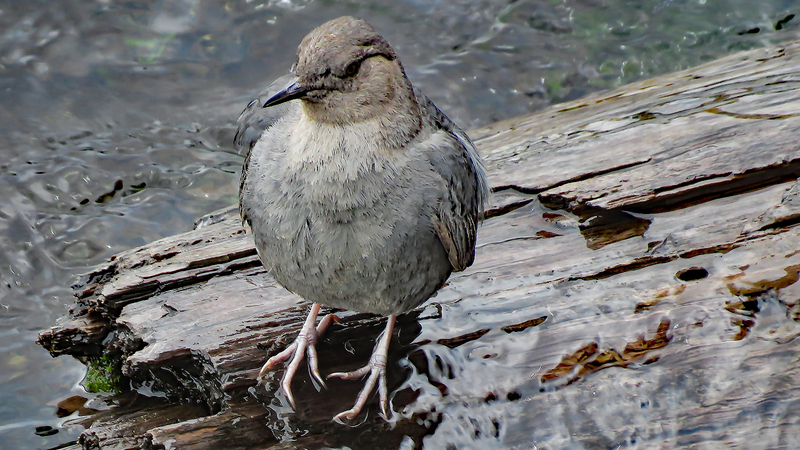 The most unusual feature of this rather dull colored little bird is that it walks underwater, à la those old deep-sea divers with the big brass helmets, canvas body suit, weighted belt and lead shoes. It does have strange feet, so it might be able to grip the bottom, but I suspect that it has a way to regulate its buoyancy, so that it sinks to the bottom, but still has enough oxygen to hold its breath. We (being Dave, Anne and I) drove to Ann Arbor. Dan, since he had been in Saint Louis little over 24 hours, wanted to stay a little longer and catch up with his friends. He’ll join us at the cabin later. It is hot here too and there is no AC at Chez Harry’s, but for a night we can make do. I have a fan, Dave has the basement and Anne is home. It’s all good. Harry and Jane fixed dinner and we all dined on the back deck. It was a lovely evening for dining out, sort of speak. We listened to “Big Sky” by A. B. Guthrie Jr. The third in our trifecta of audio books with a Montana theme. This one is set in the 1830s and follows two boys who journey west from Kentucky. They both want to be mountain men and halfway through, both have managed to keep their hair. One disturbing aspect of the novel is its pervasive use of the N-word. Now, there is not an African-American character in the whole book (another disturbing feature), but I still wonder at the use of this now hateful word. The book was written fifty years ago and employs plenty of other colloquial words and phraseology, but I still stutter at each utterance of this word, even when it is spoken by a white speaker about themselves. Still, it is an interesting story that most closely traces our travels than any of the other audio books that we have listened to. PS – It is now already much cooler than before. This entry was posted in Birds, Books, Nature, Photography by RegenAxe. Bookmark the permalink.